Waxwell Lane Car Park to be used by Film Production Company – 28th March to 1st April. 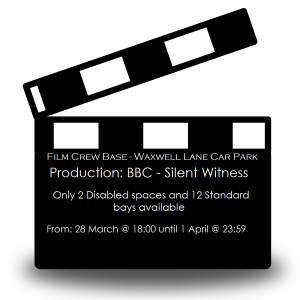 The Pinner Association has been informed that the Waxwell Lane Car Park is being hired as a filming unit base (BBC – Silent Witness) to facilitate filming in the area as from 18:00 hrs on Thursday 28th March 2019 until 22:00 hrs on Monday 1st April 2019. Harrow Council have agreed that a row of bays in the car park will be made available to business permit holders and disabled parking badge car users during this time. The production company have also agreed to release bays if they are not in use during the day if available. Harrow Council apologise for any inconvenience this may cause and advise members of the public to utilise the Chapel Lane car park as an alternative parking option, or use the pay and display bays along nearby Bridge Street. Harrow Film Service (Harrow Council) apologies for the short notice of this use of the car park, which is due to the late confirmation by the production company and various schedule changes.